Posted under Health Guides. Updated 1 December 2017. Nobody likes to feel stressed, anxious, or overwhelmed, but sometimes these feelings occur when you have a lot to do. If you learn to manage your time, you’ll lessen these feelings and get the most out of your free time. Time management is about using your time wisely so you can get things done, such as completing homework assignments and projects, going to practice, and still having time to do fun things. Learning how to manage your time takes a while. Most people agree that you’ll need to learn and use a set of skills which include planning, prioritizing, and goal setting in order to manage your time well. Learning how to manage your time is important because it will help you balance your academic and social life. You’ll find that when you become organized you’ll be able to get a lot done in a shorter amount of time and still be able to enjoy yourself. 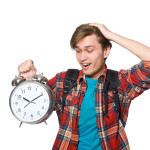 What are some of the advantages of time management? Reduce feelings of stress and anxiety: When you learn to manage your time, you won’t be doing things at the last minute, and you won’t feel any nagging pressure. Stop cramming: You’ll be able to do a better job on your assignments because you started earlier and had more time to do research before you start, and make edits after you’ve reviewed your work. Gain time: After you finish with your assignments you won’t have to worry about them anymore, so you’ll have more time to do whatever you want without having your “To-Do” list on your mind. Use a weekly or daily planner to keep track of all of your assignments, projects, and deadlines. Make a “To-Do” list of ALL the things that you have to get done and when they are due. You can create a list of things/assignments that you have to get done within a month, within a week, or for the day. The time frame depends on your personal preference. Prioritize your “To-Do” list. Identify the things that are most important and what can wait. This will help you get the more important things done first. Start with the most important thing on your “To-Do” list. Keep going from there and cross off each item as you complete it. Use your free time wisely. High school and college students (particularly college students) find that they have a lot of free time and tend to waste it spending hours with friends, watching TV, or spending time on the internet. Try this strategy: Take the time to watch one of your favorite shows and then turn off the TV and work on your “To Do” list until you can cross off another item. Continue with this process until you have completed your list. Now, let’s take this sample list and prioritize it. Let’s pretend that today is Monday. The reading should get done first, because the class discussion is tomorrow (Tuesday). Studying comes second, because the quiz is on Thursday, after the class discussion is over. Writing the draft of the paper comes third, because it’s not due until a week from today. Going to the art museum can wait until the weekend, because the sketch isn’t due for two weeks. What if I can’t finish my list? Depending on what type of “To-Do List” list you make (assignments for the month, week or day) you may not get to finish everything. The point of prioritizing is to get the most important things done first. You don’t necessarily have to finish your entire list in one day, and you shouldn’t feel stressed out about not being able to complete all the tasks on your list. Instead, make a new list and re-prioritize the things you have to get done. Practice makes perfect. You have to practice the skills of time management to get good at it. Within a couple of weeks you’ll see the positive difference that being organized can make.